sysfrontier, Author at SysFrontier Inc.
How to fix corrupted voice memo (m4a) files. Do you have broken voice memo files? You can fix those files by yourself. I will show you the steps in this article. Voice memo files have the extension “m4a”. 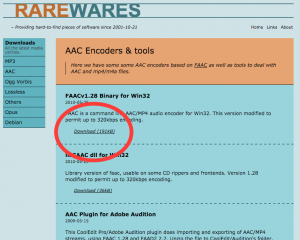 It is audio data encoded in the AAC format and encapsulated in MPEG4 file container. By following the instructions in this article, you can also repair files recorded by other apps like QuickVoice or recorded on Android phones, whose extensions may be “mp4” or “3gp”. The m4a files get broken when some parts of header lost correct information. For example, when the bytes indicating the length of the audio data become 0, the file can not be replayed any more on iPhone, iPad, Mac or Windows PC. But, in some cases you can fix the broken header by yourself by extracting the audio data, encoding it, and putting it into the new file container. 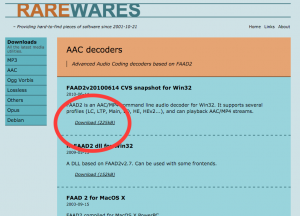 Click “Download (225kB)” of “FAAD2v20100614 CVS snapshot for Win32“. 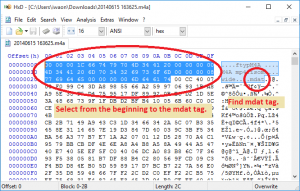 Extract faad.exe from the downloaded zip file. Place it in the “Downloads” folder, for example. Be noted that the extracted file name is “faad.exe” although the downloaded file name is “faad2-20100614.zip”. 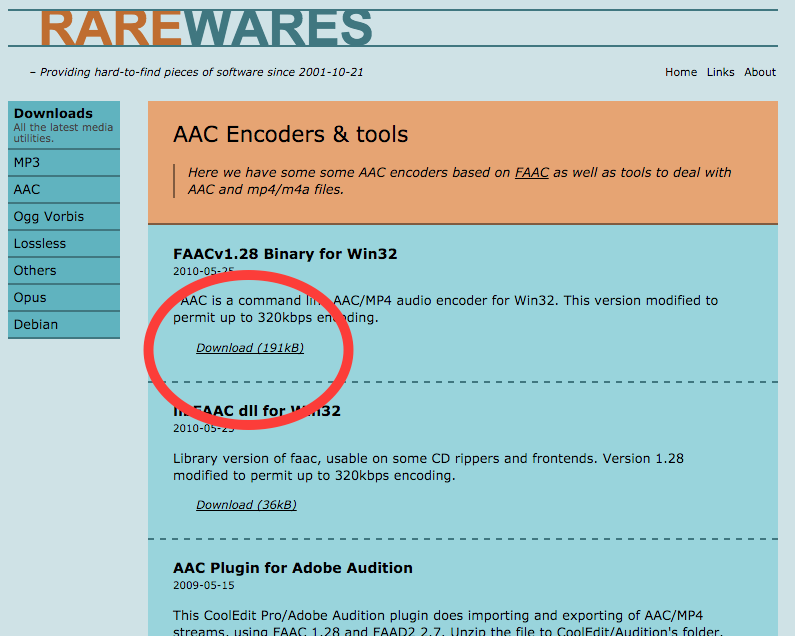 Click “Download (191kB)” for “FAACv1.28 Binary for Win32“. 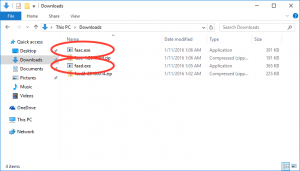 Extract faac.exe from the downloaded zip file. Place it in the same folder as above. 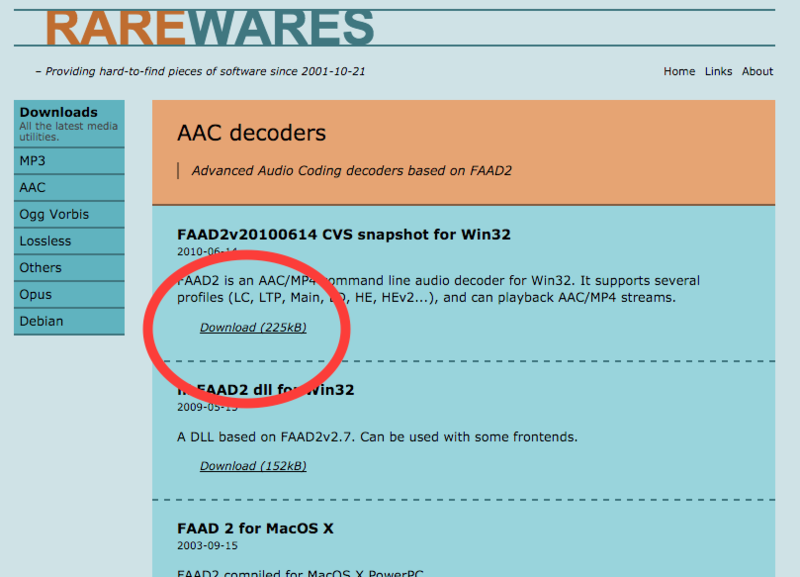 For example, you see faad.exe and faac.exe in the Downloads folder as below. You can choose any favorite hex editor. If you don’t know well, I will recommend HxD. Extract setup.exe and click it to install. 4. Place the file to the same directory. Move your voice memo file from your iPhone to PC via iTunes. You can use other tools like iFunbox. 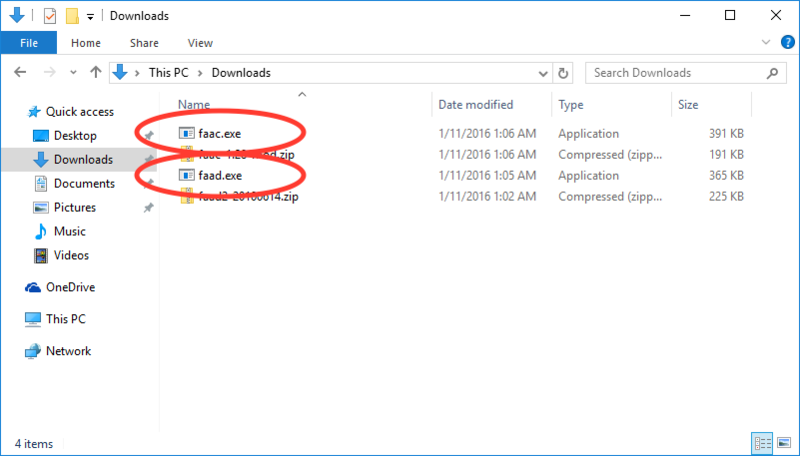 Please place the copied file to the same directory as where you placed the above faad.exe and faac.exe. We call the file “20140615 163625.m4a”, for example. 5. Open the file with binary editor. Please copy the broken m4a file to some folder for backup. Start HxD or your binary editor program and open the broken m4a file. Press F key with control key to open the Find box. Type “mdat” and press the Find button. 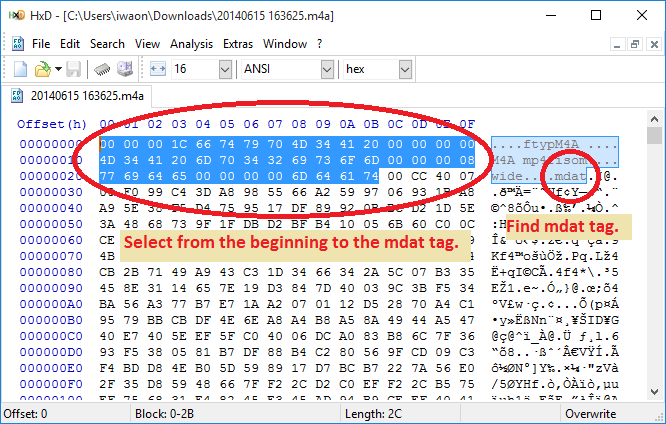 Select from the beginning of the file to the “t” of “mdat” as shown below. You have to select everything before the word “mdat” plus the word “mdat”. Press Delete key to delete the selected area. Press S key with control key to save. Press R key with Windows key to open the dialog. 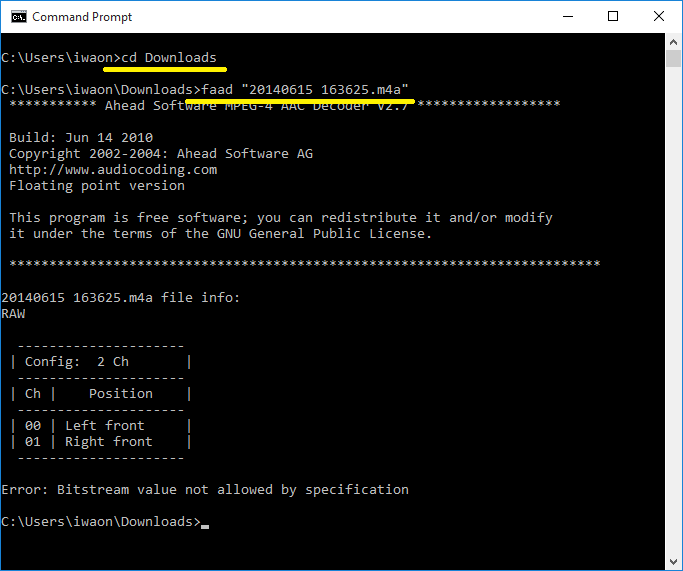 Type “cmd” and press OK button to open the Command Prompt. 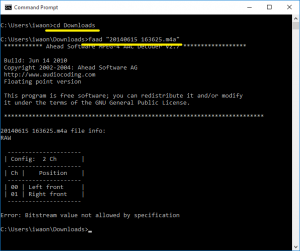 In the command prompt window that was opened, type “cd Downloads” to move the Downloads folder. Type faad.exe “20140615 163625.m4a” and press the Enter key. In seconds or tens of seconds, you will find the decoded wave file named “20140615 163625.wav“. Check if the command histories are like below. In the command prompt window, type faac.exe -b 160 -o repaired.m4a “20140615 163625.wav” and press the Enter key. In seconds or minutes, you will find the encoded file named repaired.m4a. Please replay the repaired.m4a to see the audio content is what you want. If you encounter any difficulties, please feel free to post a comment. You can pay the fee via PayPal. If the file is very large, please upload it to Dropbox, Google Drive, or WeTransfer and send us the share link. 3-23-16, Ekoda, Aoba Ward, Yokohama, 225-0005, Japan. Author sysfrontierPosted on December 31, 2014 March 26, 2019 332 Comments on How to fix corrupted voice memo (m4a) files. Armin on How to fix corrupted voice memo (m4a) files. CJ on How to fix corrupted voice memo (m4a) files. Barry on How to fix corrupted voice memo (m4a) files. sysfrontier on How to fix corrupted voice memo (m4a) files.